How many times have we all heard the saying ‘fix it in post’? I used to cringe every time a director or camera operator would say those words but looking back I can finally say ‘Thank You’. All the times they relied on me fixing a shot in post not only gave me a job to do but also challenged me to learn new skills, new ways of fixing shots. Sometimes fixes were really easy, with the aid of matte paintings but other times it was a frame by frame painful task. In an ideal world, every camera operator would get it right the first time but it’s simply not possible. Getting a smooth pan or tilt while focus pulling and changing iris is not an easy task. Gambles and rigs can help stabilise footage while shooting but preparing for post is always a good idea. If you are sure that you will need post stabilisation I strongly suggest you up your shutter speed. The higher the shutter speed the less motion blur in your camera shot and the easier it is to stabilise in post-production without it making it look really blurry. If you’re shooting in 25p perhaps consider a shutter speed of 1/100, or even 1/200 if you are filming fast paced action. When Adobe CC came out the main reason to upgrade was the ‘Warp Stabilizer VFX’ effect. 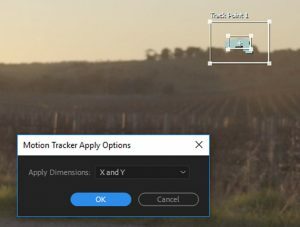 A magic effect that could stabilise shaky footage with one click of a button. Mostly it does a really good job stabilising shaky camera footage and most of the time it’s all you need to get the perfect result… or is it. 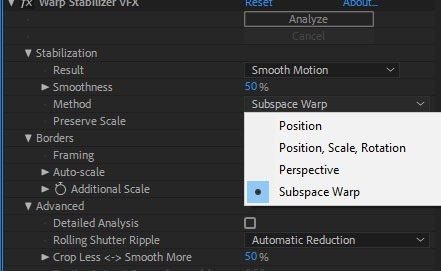 There are a few small caveats with Warp Stablizer VFX that you should know about. The footage you are stabilising needs to be on a sequence that matches the resolution of your footage. If there any large objects moving in your frame you may need to mask them out and pre-compose your footage before applying the effect. Once your footage is stable you can turn off any masks. I use/ and modify a few settings on a regular basis that you should know about and use. Result: reasonably self-explanatory. If you are trying to remove all movement in your shot use ‘No Motion’ otherwise select Smooth Motion. 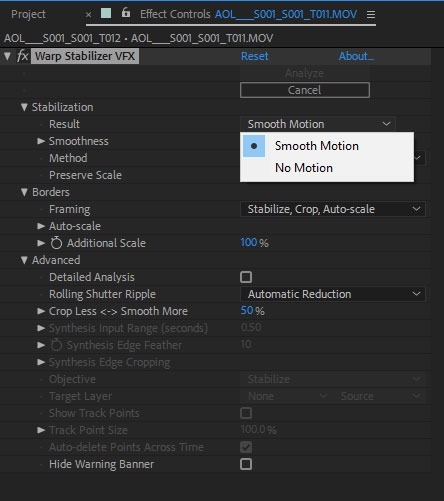 Method: this describes the method that after effects will attempt to smooth your shot. The default setting is subspace warp, this will warp your picture to the best of it’s ability to match any rotation, position, scale and perspective changes. This can have a very weird effect on the footage that may look like something resembling motion sickness. If you know your shot only requires position, scale and rotation (the camera is not moving back or forth) then you are far better off going with the other settings. Smoothness: This is defaulted to 50%. This may actually be to high for your desired result. If you have a handheld shot and wish to just remove the sharp shakes out of it then lower the value to around 10-15%. You will also end up with less distortion on the image. Use the ‘Stablize Motion’ button in the tracker tab. After selecting your track point use the Analyse forward and backward buttons to run through your shot. Once the track is complete, in the Tracker tab you can select you wish to place your data on. 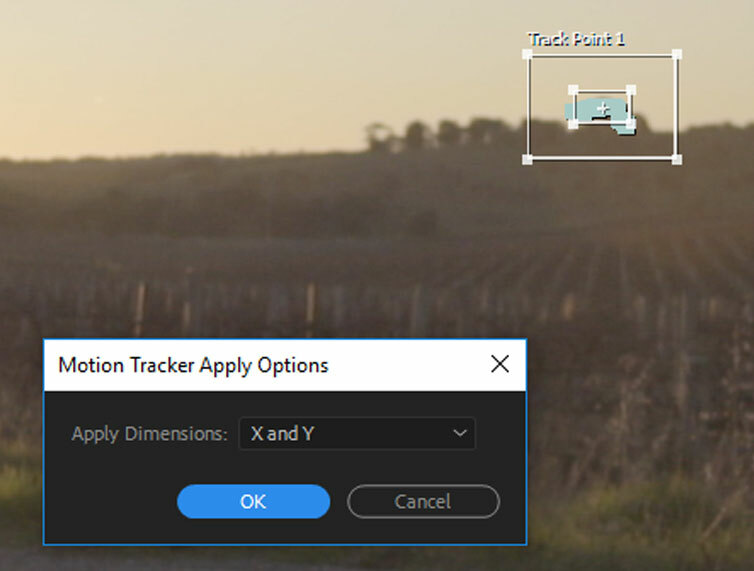 You can select a Null, an object or the video clip you wish to stabilise.